Course summary: Bring home your own hatchet / hand axe on this course, where an axe is forged from solid carbon steel. 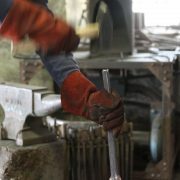 The course is suitable for beginners, though axe-making is the hardest of our courses – in terms of physical strength. If you have any issues with wrists or shoulders it is not recommended to sign up for this. 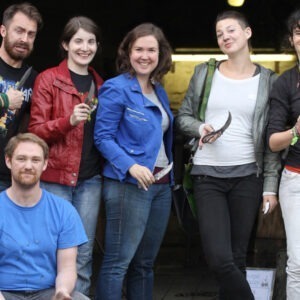 Consider signing up for our blacksmithing taster course or some blade-smithing instead. 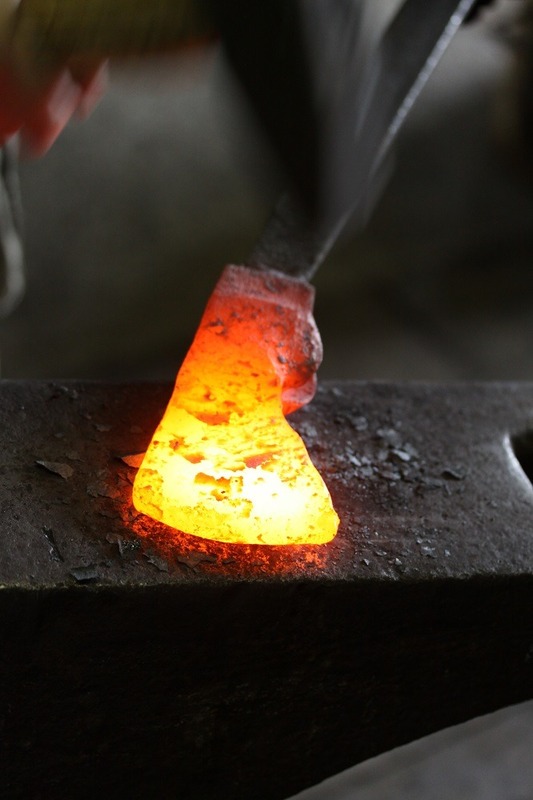 Same process – smaller hammer! 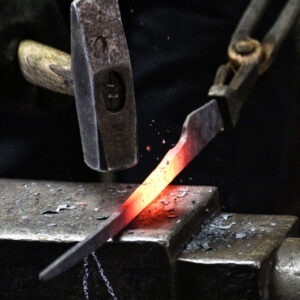 Blacksmithing techniques: drawing out (tapering), spreading, punching, sets, forging of carbon steels, basic heat treatments. This is a one-day course in practical hands-on axe making, specifically for the forging of axe heads. Arrival is at 9am, where Gunvor the tutor will introduce the forge. The participant’s individual work spaces as well as health & safety is covered. The correct use of the coke hearths involves how to maintain the fire. How to achieve the correct heat in the right place. The minimum and maximum heat ranges and their corresponding colors. To give you some insight into the working day of a full-time blacksmith Gunvor will usually fill you in as to what’s currently on at the forge. If you are interested in full-time education in the craft, you will get a chance to ask the tutor about this. After the introduction it’s time to make an axe. There are several ways to forge an axe. Forging from solid carbon steel is hard work, but a good result is generally guaranteed. 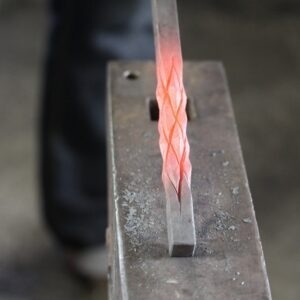 Other methods involve fire welding, a good skill to master, but a time-consuming technique to learn. The first part of the project involves making the eye of the axe head bigger using a drift. Next you work on the cheeks or lugs of the axe. Once complete, it’s time to set in using the fly press. This starts the off-set or slightly bearded axe type. The power hammer will take care of the blade-spread, or if you are feeling very fit you can do this by hand 🙂 Finishing touches involve thinning the blade and drifting the eye bigger from the top so it accommodates the handle as well as the wooden and steel wedges. Forging complete it’s time to grind, file and sand. Then we do the heat treatments. We will use the coke-hearth for this three step process. 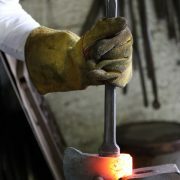 It’s the same way a blacksmith would do the day to day hardening of tools without the use of gadgets – its back to basics! 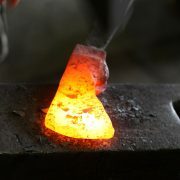 After the hardening is complete, its time to go home and temper the axe head in the oven. A pre-shaped hatchet handle and wedges are provided. 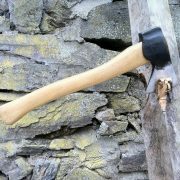 Axe-making is the hardest of our courses – in terms of physical strength. If you have any issues with wrists or shoulders it is not recommended to sign up for this. 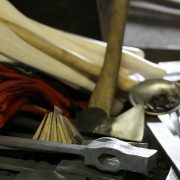 Consider signing up for our blacksmithing taster course or some blade smithing instead. Same process – smaller hammer! Why not travel to England and participate in a three day axe making work shop by Owen Bush. Or you can travel to Sweden and learn from the pro’s at Granfors Bruk. Both come highly recommended. For a number of years, the idea of making something in a blacksmith forge appealed to me. Having watched several videos on youtube on the subject I decided to go for it and booked this course. 6 likeminded people listened eagerly to Gunvor’s expert instructions and began heating our lumps of metal before bashing the living daylights out of it. Slowly but surely it started to resemble something remotely looking like an axe. Ray Mears would be proud. The atmosphere was fantastic and after a long day, each of us were beaming with a smile from ear to ear holding our axe heads. Thanks for a truly memorable experience that will stay with me forever! Aw – thanks Scott !